The summary text is adapted from “Hosha: A Pictorial History of Jodo Shinshu Women in Hawaii” (1989). In 1889 when Myonyo Shonin was the Monshu at the Honzan in Kyoto Japan, Rev. Soryu Kagai was sent to Hawaii to do missionary work among the Japanese contract laborers. Spiritual guidance was lacking and there was no priest to provide any religious services, even the simplest funeral rites. Later in 1898, Rev. Honi Satomi arrived as the first Bishop of the Hongwanji Mission of Hawaii and organized the Betsuin Fujinkai, the first Jodo Shinshu women’s organization in Hawaii. Much of the groundwork of the Fujinkai however, is credited to the second Bishop Rev. Yemyo Imamura and his wife, Kyoko. That same year, Rev. Gyoshin Sato of Kona also organized a group called the Buddhist Women’s Club and it included members from the six satellite temples along the Kona Coast. In October of 1903, the Hawaii Betsuin Fujinkai elected the Bishop’s wife, Mrs. Kyoko Imamura as the president. On March 4, 1904, Lihue Hongwanji formed their Fujinkai and elected Mrs. Mineo Miyazaki, wife of Rev. Hiseki Miyazaki as their president. Wailuku Hongwanji Mission formed their Fujinkai in March 1905, and Mrs. Hojo Miterai served as the president. In the next few years, many district fukyojyo (structurally smaller than a temple, but fully equipped to propagate missionary work) and temples throughout the island chain established their Fujinkai groups. From 1898 to 1978 the Fujinkai or Buddhist Women’s Association was formed at each temple as the temple was built throughout the Hawaiian islands. We have assembled a table showing the year each temple was established and the year the Fujinkai was formed. The Fujinkai years are arranged chronologically. 1899 1908 or 1915 Honohina (BWA – Centennial in 2008)? 1900 1908 or 1911 Pahala (joined with Naalehu in 1959)? 1902 1909 or 1907 Puna (formerly called Olaa)? 1903 1909 or 1910 Waialua? 1907 1909 Kilauea (merged with Kapaa in _____) ? 1938 1941 (1950 or 52) Jikoen? Note: It was very difficult to reconstruct the above history of dates. To maintain better accuracy, please contact us for corrections or additions to the above information. During the early years usually the Bishop of the Hawaii Kyodan’s wife served as president of Hawaii Betsuin Fujinkai and the resident minister’s wife served as the Fujinkai president at the individual temple. We have assembled a table showing the names of the wives of Hawaii Kyodan bishops and their dates of service. In April 1954, during Bishop Aoki’s tenure, the Hawaii Federation of Buddhist Women’s Associations was officially formed. When the inaugural ceremony was held on April 17, 1954, Monshu Kosho Ohtani and Lady Yoshiko Ohtani presided over the auspicious occasion. The membership of the Fujinkai in Hawaii exceeded 7,000 that year. According to the Bylaws the Bishop’s wife continued to serve as president of the newly formed Hawaii Federation of BWAs as well as the Hawaii Betsuin. Also in the fall of 1954, each Fujinkai/BWA unit became united by their island districts and today there are five United Buddhist Women’s Associations. They are from Honolulu, Oahu, Hawaii Island (Big Island), Maui (Lanai included) and Kauai with their own respective set of bylaws, officers, directors and advisors. In 1961, Hawaii Fujinkai members joined the World Buddhist Women’s Association at the 1st World Buddhist Women’s Convention which was held in Kyoto Japan and four years later in 1965 joined the 2nd World Buddhist Women’s Convention held in New York City, New York. Mrs. Jane Imamura, wife of Bishop Kanmo Imamura served as the Hawaii Federation of BWAs president from 1967 to 1974. The 3rd World Buddhist Women’s Convention was hosted by Hawaii and held in June 1967 at the Hawaii Betsuin with 1200 delegates world wide attending. A resolution to adopt the Student Exchange program was passed at this convention and in 1971, two young women Gail Mamura and Jan Aratani were selected the first participants to visit Japan. *(see Student Exchange). The 4th World Buddhist Women’s Convention was held in April 1970 at Osaka Japan. The Buddhist Study Center opened its door in 1972 and the 85th Anniversary of the Honpa Hongwanji was observed in March 1974. Upon the suggestion of Jane Imamura the Hawaii Federation of BWAs Bylaws were changed allowing for a non-Bishop’s wife to resume the role of Hawaii Federation president. The present Bishop’s wife would assume the title of Honorary President. When the Imamuras suddenly left Hawaii in May 1974, Mrs. Kimiko Okano served for a few months as the first president in this capacity. Bishop Yoshiaki Fujitani was elected as Hawaii’s second nisei Bishop at the Legislative Assembly in February 1975 and due to a change in the Hawaii Kyodan Bylaws, the separation of Kyodan and Betsuin occurred for the first time. The membership of the Fujinkai in 1975 was 6,400 women. Thus, the Hawaii Betsuin Rimban’s wife became president of Hawaii Betsuin while Mrs. Toku Umehara served as the 2nd Hawaii Federation president after the Bylaws change. She served for a total of 19 years from 1975 to 1993 while working part time in the Education Department of the Hawaii Kyodan. During the same time, wives of the Bishop, Mrs. Tomi Fujitani (1975-1987) and Mrs. Junjo Tsumura (1987-1990) served as Honorary Presidents. The Hongwanji was very busy during this growing period. The Living Treasures of Hawaii program began in 1976. The 36th temple, Mililani Hongwanji, was established in 1977. Hawaii hosted the 7th World Buddhist Women’s Convention in July 1982 at the Waikiki Sheraton Hotel with 2200 delegates world wide. The membership of the Fujinkai in 1984 was 5,600 women. 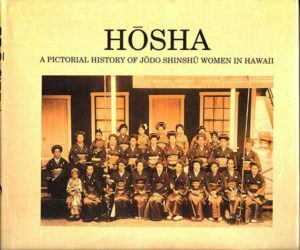 We also observed the Centennial celebration of the Honpa Hongwanji Mission of Hawaii in 1989 and two publications were made: “A Grateful Past, A Promising Future,” and “Hosha: a Pictorial History of Jodo Shinshu Women in Hawaii.” During Mrs. Umehara’s tenure, five world conventions were held: August 1974 (5th – San Francisco California), June 1978 (6th – Sao Paulo Brazil), July 1982 (7th – Honolulu Hawaii), October 1986 (8th – Kyoto Japan), and April 1990 (9th – Vancouver Canada). Upon Mrs. Umehara’s retirement, Mrs. Fusae Kiyokawa served as president of the Hawaii Federation of BWAs for six years (1994-1999) due to another change in the Bylaws. During her tenure, Hawaii BWA continued to be actively involved at all levels: Worldwide, Statewide, United Districts and Unit. The membership count in 1996 was 4,100 women. In September 1994 and April 1998, Mrs. Kiyokawa lead the Hawaii delegation to two world conventions: the 10th in Anaheim California and the 11th in Osaka Japan. The Bishop’s wife, Mrs. Amy Nakanishi (1990-1995), served as Honorary President. Mrs. Rose Nakamura succeeded Mrs. Kiyokawa and served as Hawaii Federation president from 2000 to 2003. She led the Hawaii delegation to Sao Paulo, Brazil for the 12th World Buddhist Women’s Convention in October 2002. The same year we saw the start of the Pacific Buddhist Academy, the first Buddhist High School in the United States. Assisting the Federation was Mrs. Chihoko Yosemori (1995-2006) serving as Honorary President with Bishop Chikai Yosemori and Rev. Shigenori Makino serving as advisors. The Hawaii Federation BWAs president who served from 2004-2007 was Mrs. Carol Yamamoto. The Hawaii Federation of BWAs successfully hosted the 13th World Buddhist Women’s Convention in September 2006 in Hawaii with approximately 4,000 delegates and guests. The theme of the Convention was “Buddha’s Vow My Aspiration. May There be Peace in the World and May the Buddha Dharma Spread.” Assisting the Hawaii Federation BWAs was Bishop Chikai Yosemori, Mrs. Chihoko Yosemori, and Rev. Shigenori Makino who served until their respective retirements. Bishop Thomas Okano, Mrs. Michiko Okano and Minister Advisor, Rev. Eric Matsumoto, began their tenure in March 2007 and in January 2008, the leadership of the Hawaii Federation of BWAs was passed from Mrs. Carol Yamamoto to Ms. Donna Higashi from Honolulu District (5th Lay President). 15 of 33 Temple Unit BWAs have already observed their Centennial celebrations by the end of 2009. What a tremendous feat. The first group established was the Hawaii Betsuin BWA in 1898 and the newest addition was Mililani Hongwanji BWA in 1978. We are deeply concerned about membership as members are becoming more and more elderly and the Hawaii Federation has lost close to 500 members since 2005. To this end, we have implemented a new membership policy by counting active and associate members separately. We must continue to recognize the long-time members of the BWA and not merely drop them from our membership lists because of their inability to pay dues or participate in current activities. In February 2011, Mrs. Tamayo Matsumoto became the Honorary President of the Hawaii Federation when her husband Rev. Eric Matsumoto became the 16th Bishop of the Honpa Hongwani Mission of Hawaii. Rev. Shindo Nishiyama was assigned Hawaii Federation minister advisor. The unexpected Japan Northern Tohoku Earthquake and Tsunami in March 2011 caused many individual and group travel plans to change. Our hopes of taking over 300 delegates to Japan were dashed. However, in May 2011, Bishop Eric and Tamayo Matsumoto, Hawaii Federation minister advisor Rev. Shindo Nishiyama, and President Higashi led a small contingent of BWA members and their families from Hawaii to the 14th World Buddhist Women’s Convention and the 750th Memorial observance of Shinran Shonin in Kyoto, Japan. It was a trip that will not be easily forgotten. After serving for two consecutive terms (2008-2011), Ms. Higashi stepped down and Mrs. Janet Honda, the first President from Oahu district (Mililani) was elected for her first term as the 6th lay Hawaii Federation of BWAs president in January 2012. To comply with nonprofit law, our bylaws were amended and Mrs. Honda chaired the Hawaii Federation of BWAs First Annual Spring General Assembly Meeting in March 2013 and immediately began preparing for the 15th World Buddhist Women’s Convention Pre Convention Representative meeting held in Calgary, Canada in 2013. Once every four years, on the year preceding the World Convention, a State Membership Conference is held open to all members from around the state. In 2014, it was sponsored by the Big Island United and held at the Kona Sheraton Resort and Spa. A highlight of the program was the celebration of the Hawaii Federation’s 60th Anniversary (established in 1954). Living past presidents were recognized (Fusae Kiyokawa, Rose Nakamura, Carol Yamamoto and Donna Higashi). It was during her term, the new purple BWA Polo Shirt was designed. Mrs. Honda was re-elected for a second term and along with Bishop Eric and Mrs. Tamayo Matsumoto, and Minister Advisor Rev. Shindo Nishiyama led the Hawaii delegation to the 15th World Buddhist Women’s Convention in Calgary, Canada in May 2015. Hawaii was well represented by delegates from all Uniteds. She also was the first BWA Federation President to attend BWA meetings on the Big Island, Maui, and Kauai. Succeeding Mrs. Honda in January 2016 was the previous 1st Vice President, Mrs. Irene Nakamoto. She is a member of Honolulu United. During her term we welcomed Lady Ruzumi Ohtani, wife of new Monshu Kojun Ohtani, as the President of the World Federation. She succeeded Lady Noriko Ohtani who served for many years. Mrs. Nakamoto’s first Spring Rep Meeting and Annual Meeting was held at Kailua Hongwani on March 12, 2016. To provide the opportunity for Reps to visit other temples, subsequent meetings were held at Mililani, Pearl City and Jikoen Hongwanjis. Some reflections of her two years were: An Annual talk story/social hour before each Giseikai meeting where BWA members throughout the state could gather, talk and socialize; Financial support to the Pacific Buddhist Academy, Hongwanji Mission School, Honpa Hongwanji Mission of Hawaii Ministerial Training Fund, Ohana Arts, YESS Camp for students ages 13-23; The ”Buddhist Women’s Pledge” was put to music by BJ Soriano of Hilo Hongwanji BWA (you can play the music on the About HFBWA page); Continued to participate in the Martin Luther King, Jr. Parade (4 years) and attended the NAACP Awards Gala; 2018 Joint Conference Planning committee leadership. Updated 10/31/2017. Written by D. Higashi, January 2008, and edited December 2009. With contributions by Rev. E. Matsumoto, M. Okano, R. Nakamura, C. Yamamoto, F. Kiyokawa, and C. Yosemori (Japanese translation). For a list of Student Exchange participants from Hawaii, see Student Exchange. In September 2006, a DVD called “The Lotus Blooms in Hawaii,” a pictorial history of the Buddhist Women in Hawaii, was made in commemoration of the 13th World Buddhist Women’s Convention. Please contact us if you wish to view this DVD.